With lost teeth, remaining teeth can shift, and patients can become susceptible to bone loss. Your facial muscles may sag, making you look much older, and your confidence often suffers as well. Missing teeth don’t have to mean the end of good oral health or a fabulous smile. We can replace lost teeth with dentures. 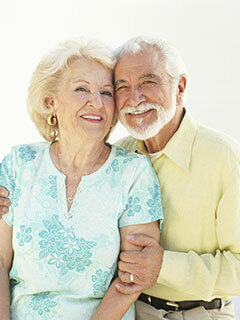 Designed for esthetics and comfort, dentures will revive your oral health and contribute to your overall wellbeing. You will once again enjoy a variety of healthy foods, including crunchy fruits and vegetables. Many people expand their social circles and renew their active lifestyles after receiving their replacement teeth. Depending on the number of missing teeth, patients will need either full or partial dentures. To replace all the teeth on the upper or lower arch, we will fit you for full dentures. A partial denture fills in missing teeth on the top or bottom, resting on a metal framework that attaches to your remaining dentition. Crafted to look more like your natural teeth and fit comfortably, dentures will improve functionality and boost self-esteem.